The first was Honeyville Chocolate Milk Alternative. Available from and donated by Honeyville Grain. $12.99/can. 3 cups/gallon. Approximately $3.39/gal. We used the same rating scale for the chocolate milks as we did for the regular milks. Taste was rated on a scale of 1-5 with 1 being the lowest and 5 being great tasting. There was also room for comments. We mixed both chocolate milks into a small amount of warm water, then added cold water to make the total volume we were mixing. Honeyville' Chocolate Milk Alternative scored an average of 3.93 with a range of 2-5. The most common score given was 5. If you are expecting Ovaltine (which I personally prefer over Quick) or the heavenly chocolate milk from the BYU creamery, this isn't it. Yes, we had children who didn't like this chocolate milk--I'm guessing they were expecting it to taste like the chocolate milk they have at home. Overall though, it had a very good chocolate flavor. 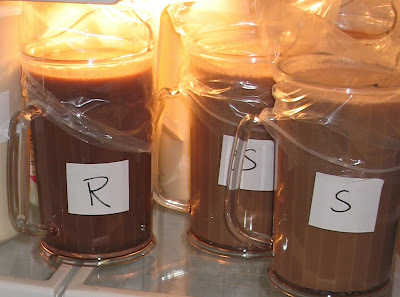 It was a little "thinner" than regular chocolate milk and needed re-mixed after sitting overnight. Some thought the flavor was too strong and/or it was too sweet. You could use less mix to dilute the flavor, but it would also dilute the creaminess of the drink. One gal who works at the local restaurant said it reminded her of the chocolate ice cream mix for the soft serve machine before it's frozen. The second chocolate milk mix was Morning Moos Chocolate Drink, available from and donated by Augason Farms. $11.82/can, 3 cups/gallon, approximately $3.09/gallon. The Morning Moos chocolate drink was a little lighter in color when it was mixed up than the Honeyville drink. It looked a little more like regular chocolate milk. The flavor was good, but the texture still wasn't like chocolate milk. It scored an average of 3.43 on the taste score, with a range of 1-5 and the most common score split between 3 and 5. This variety also needed re-mixing after sitting, and some of the kids didn't like it either, although mine had no problem drinking either of the chocolate milks. We had some comments that it was very good and some that it was too sweet. It was also interesting to note that the Honeyville can said it would make 15 quarts and the Morning Moos can said it would make 20 quarts, but they both mixed 3 cups to a gallon and both cans had 5 lbs of powder in them. I estimated you could get a little over 15 quarts (not quite 4 gallons) out of each can by using the recommended 3 cups of mix per gallon. We actually found the way we liked either of these chocolate milk drinks best at our house was to mix half chocolate drink and half milk together. Even a powdered milk worked. It dulled the sweetness a little bit and added "milk" flavor and texture to it. Mixed half and half like that made it taste more like drinking the chocolate milks that are mixed into milk. Overall, either of these drinks would be recommended and nice to have for a little treat in your food storage that also provides a good amount of vitamin A, vitamin D, and calcium. Thanks again to Honeyville Grain and Augason Farms for helping out with this experiment! Click here to view the embedded video. 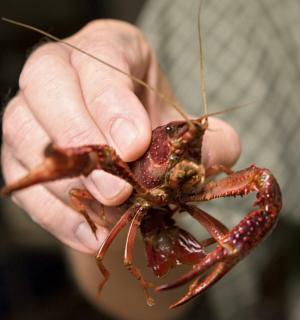 Crayfish cannot support you as a primary food source. I have never seen anyone pull more than an appetizer worth from a single trap (but then again I’m from the North East) but as a protein and vitamin rich addition to your pasta or Ramen crayfish can help stretch out the larder you have. And they are delicious with Tabasco. But more importantly they are easily trapped, and a trap line is my preferred method of making meat in an emergency because it requires the least amount of time and energy, freeing me up to do all the other things that will need doing after TEOTWAWKI. Trapper Arne’s Crayfish Page is a good start on learning about harvesting these little morsels. If you are anything like me you have probably been thinking about gardening since the first frost killed off the last of your summer produce makers. However many people are thinking about gardens these days. Seed supplies are running low and many are dreading the worst of this economic decline. Some even remark how recent legislations in the food industry threaten to cripple our food supplies. Still others just like the taste of really, really great food, fresh from their own little piece of earth. Either way, you may be thinking about a garden for the first time, or maybe re-planning your garden layout. In the past several years I have just put seeds in the ground wherever I had space. This year I am thinking more strategically about the garden, and as I look at the pile of seeds I have accumulated over the years I am wondering just where the heck I am going to put everything. So I got out the 300' measuring tape, some rope and some stakes to really put forward my plans. If you are starting from scratch, you will want to survey your area. Look for a place that has full sun most if not all the day. How big you want your garden is strictly up to you, these basics should work for you. The very next thing you want to do is start tilling. Start tilling now! Now before you say, 'Oh wait, I need a tiller' think again. I have roughly 9,000 square feet of gardening area and I till everything with nothing more than a shovel. It's a great work-out, and it get's easier from one year to the next. In fact, I have shovel-tilled my garden for two years now, and this year my soil is so soft I could probably get away with not tilling at all. However I want to turn the earth for one or two more seasons before my heavy mulching plan goes into effect full time. But more about that later. Shovel-Till: To shovel-till your garden, all you do is stick the spade in the earth and drive it with your foot all the way to the top of the shovel. Lever down on the handle, picking up grass, earth and all, then flip it over on top of itself. This exposes the roots of the grass and pretty much kills it for the most part, leaving the earth part facing up, the grass part facing down. I recommend shovel-tilling for a number of reasons, but the most important to me is that I believe you get a much better depth using the full 6" blade than a 6" depth setting on a tiller. With a shovel you get a TRUE 6" into the earth, however with a tiller, the tiller only reaches about 4" effectively despite what the depth setting is. The reason for this is that on the first pass, the tiller digs up about an inch to two inches of soil and fluffs it. As the dirt gets fluffed up this adds height to the earth-line which means that if it takes 2" of soil and fluffs it to 3" then your second pass is less effectively really only re-fluffing the soil you have already dug up. The reasoning behind my theory is that the first year I gardened I used a tiller. The very next year, I used only a shovel, and found that just below the 3" mark on soil depth I found a strata of earth that the tiller never touched in the previous year. To be fair however, I recommend using a tiller at least the first year, especially if you are just getting started. Makes that first year a bit easier. Otherwise shovel-till repetitively until you have your base gardening dimensions. I recommend a rectangular arrangement for the garden footprint, however many people do a number of different configurations, circles, triangles, squares, and even more complicated geometric patterns. If you go with the rectangle I prefer the garden to run east-west on the long side, and North to South on the short side. There is a reason for this. East-West Orientation: There is a great deal of conversation behind the east-west orientation and a north-south one. Many believe that a east-west orientation does not allow for maximum sun-exposure for vertical gardening (a concept we will explore in a minute). There are three things that I take issue with on this subject. #1. If anyone has ever been outside in June, July and August here in the south you will find that escaping the sun is very difficult. The sun comes up in the east and sets in the west. Which theoretically means that in a trellised garden some rows will not get much in the way of morning or evening sun, however for about six hours or so between 10:00 a.m. and 4:00 p.m. everything will be getting hit with full on sun. I do not believe those early morning and late evening intervals are necessary for great food production. In addition, there really is NOT any time of the day where plants are not getting some kind of sun, whether direct or indirect. #2. There is some scientific research on sunlight utilization among garden plants and it appears that once a plant 'sees' some sun it gathers all it needs, then shuts down for several hours as a full day of sun is not necessary for energy production. If plants get all the sun it needs from the morning sun it then shuts down photosynthesis for the remaining day until energy stores are depleted. The metabolic cycle is then fired back up and more sunlight is gathered depending on how much sun the plant needs for energy then shut down again for the evening. #3. Sunlight is crucial for brix levels among sweeter fruits etc. Vineyards and Orchards require HUGE amounts of sun and I have seen these planted extremely close together. Vineyards for example are planted in all sorts of configurations, N-S and E-W without any fear of shading each other out. The one thing where I would accept the argument for N-S to E-W discussion is in the case of rain-forest type areas where cloud cover shields direct sun from plants. Vineyards will hardly make any sugar at all in grapes for Hawaii because there is so much yearly cloud cover. In fact, grapes from Hawaii have to be sprayed with a chemical in order for them to ripen enough for wine. However, here in the states as long as you do not plant your garden in the shade, you should be fine. Finally, and East-West orientation ensures maximum pollination for wind pollinated varieties such as corn. PermaCulture: You could spend years research and reading up on the ideas of permaculture. However if there is one thing you should take from the idea is that you will want to #1: Create permanent raised beds. This does not mean you have to encase your garden with a smattering of 2X8 boards then fill them with dirt, but rather you just raise the level of the earth itself so that the area your plants grow in is higher than the earth around it. Most of the time the act of tilling itself raises the soil level just enough for you to be able to take advantage of the raised earth idea. Raising the earth creates a dome of earth in your bed that allows excess moisture to drain off so that your root zone doesn't become water-logged. In addition the raised bed also increase marginal surface area so that plants earlier in the year stay warmer in the cool, and cooler in the hot. I create 4' wide gardening zones, in which I can plant densly or not so densely. for example, if I were to garden peas, I could easily plant my peas in three distinct rows in every 4' wide gardening zone. With tomatoes which need a bit more room, I will plant 2 rows 20" apart within that 4' zone. These are permanent growing zones that you will develop and maintain year after year. In relation to these growing zones you will want to put in some kind of permanent paths so you do not ever walk on the growing zones. This ensures your soil stays soft and 'raised'. Every once in a while I have to step into a growing zone, but because I have hardly ever walked on a growing zone in over two years the soil there is very soft and doesn't really need tilling. Heavy mulching will help this as well, but more about heavy mulching later. Lastly, my permanent paths are roughly 24" wide, or two feet. This allows me to get between the growing zone easily enough with a wheel-barrow, while not taking up too much room in the garden. Summary of Steps: #1: Determine full sun garden location. #2: assign either East-West or North-South orientation. (preferably East-West). #3: start tilling now. #4 begin to determine (at least in your head) the locations of permanent growing zones 4' wide and begin to hill these up in a raised be fashion. #5. Establish or begin to establish permanent paths. Vertical Gardening: If this is your first garden, then you may be taking a lot of what I am writing about on pure faith. Be sure that you can do research to verify my theories here, much of what I am writing about has been partly as a result of painful learning (practical) combined with theoretical learning. However after several years of trials if there is one thing I have learned is that 'Vertical Gardening' is MUCH, MUCH more superior than any other kind of gardening in existence. There are a lot of reasons for this, but I will give you just a couple. #1: Vertical gardening is MUCH easier on the back and joints. Once your plants have gotten to production stage, pretty much all you do is walk down between the rows picking your pleasure right off the vines. #2. This means a couple of things, a: Choosing the right kinds of plants for your vertical garden, and b: building trellis systems. I am still experimenting with creating the perfect trellis-ing system, however I am closer this year for the perfect set-up in cost and practicality. This will most likely come at a later post, however with regard to 'a: Choosing the right kinds of plants' this is actually easier than you may think. Fortunately for us, most heirloom species grow indeterminately. That is to say, there are no natural growing restrictions. 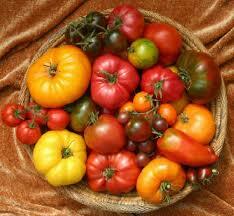 For example, just about all heirloom tomatoes will grow vines of up to nine feet or even more. Trellising these crops keeps fruit off of the ground and rotting, and provides better sun-exposure for the plant in general. In addition, there is more air-flow between plants reducing mold's and fungus diseases to non-existant. I have never had any kind of infestation on vertical vegetables. Cucumbers grow on vines that can be trellised, squash grow on vines that can be trellised, squashes grow on vines that can be trellised, melons grow on vines that can be trellised and beans grow on vines that can be trellised. Just be sure to select 'pole-type' beans. Most good heirloom beans such as Kentucky Wonder, Silverlake and others grow in a pole bean variety. Pole beans are also much more productive beans, the one caveat with pole beans is that you have to be sure to pick them in timely intervals or the pods get stringy. You have to plan a little with vertical gardening however, with regard to shorter plants like leafy-greens, and peppers. Be careful not to plant these within the vertical areas. Plant these according to height from the southernmost rows to North. That is to say, that all of your short leafy greens need to be in the southern-most rows, then your peppers in the next rows, then your eggplants and other taller varieties. Additional Stuff: Now to be sure we have only covered the very, very basics here. One of the things you will absolutely want to do is document things. Document everything, in later years you will wish like crazy you had. 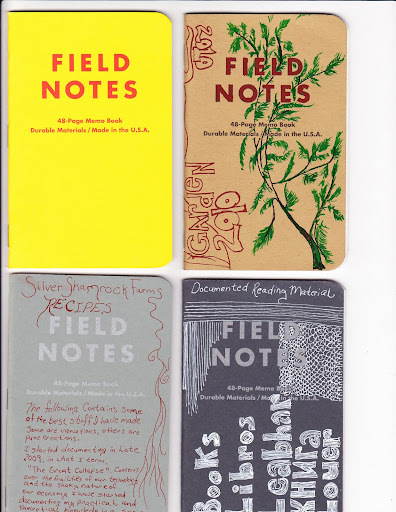 For documentation I highly recommend 'low-tech', and nothing is better than 'Field Notes' brand notebooks. They are small and easy to carry, easy to store. I have nine that I use. I carry one with me at all times, this is my multi-use notebook that I use to jot down notes, ideas, and a myriad of information. I also have several others for different more specialized things. I have a 'gardening' book for just my garden stuff. Other things you may want to do is get a soil test done, but for right now you should be good to go until next posting. Getting Some Seed Started: Getting some seed started: Check out the Iowa Preppers Network for some great video on seed starting. In case you didn’t see the link on our Facebook Page, we were recently featured on the Prepper Podcast. In listening to the show, we realized that there were a lot of things that we claimed to just let our husbands take care of that could actually be problematic in an emergency if they weren’t home. So we decided to ask our handy (and handsome) husbands to teach us some of these things that we’ve always “left to them” in the past. And of course, we wanted to share these “HOW-TO’s” with all of you so that you can be prepared too. (If you have already purchased a Food Storage Made Easy Binder we will DEFINITELY be including these as handouts in the free updates). So let’s get started! In the event of an emergency, if you have identified a potential natural gas leak, it is important to shut off your natural gas and then report the leak to 911 or to your local gas company. Here is a quick video showing how to shut off your main gas valve as well as the gas to your furnace/water heater. The gas company has to come and restart your service if you shut off the gas, so make sure you only do it IF you identify a leak. If there is no leak then it is not necessary to turn off your gas. Stealth is the art of employing simple techniques and skills in the most effective manner possible to distract attention from your presence or your activities. Even if you are seen or heard, it should be in a way that would not distinguish you from any part of your surroundings. Stealth is the art of hiding in plain sight and will allow you to blend into your environment. When you become an insignificant part of your environment, you can literally disappear within the very nature of your surroundings. S = Silence is your shield of protection that should be used generously. T = Tune in to your surroundings with a total awareness of your environment. E = Eliminate or reduce movements that may lead to unwanted exposure. A = Adapt to adversity and be ready to deal with changing conditions. L = Look for every possible advantage and see what others don’t. T = Think about the results before you act and use patience as a guide. H = Hear what others don’t, even when everything seems quiet. Stealth Edible Landscaping With Unusual Berries, by K.W. Want to eat a wolfberry? How about some vaccinium jam? Some chokeberry wine? They don’t sound too appetizing, do they? Few people know it, but the fruits of these plants are not only edible, but delicious. They have unappealing names and don’t look familiar to most Americans, so if you incorporate them into your landscaping you will have a supply of fresh, nutritious fruit that your neighbors won’t recognize as food. This makes them ideal for people who must shelter in place in a small-town or suburban environment, where houses are close together and others can see what you have in your yard. In a worst-case scenario your vegetable garden may be raided and your apple tree might be picked clean, but the ravenous hordes will leave these fruits behind, assuming they are poisonous simply because they are unfamiliar. Not everyone has a rural retreat with a spacious piece of land, so these berry bushes have the advantage of being relatively small and easy to fit into an ordinary yard. They all feature pretty flowers, shiny leaves, or other ornamental features that help them hide in plain sight, even in the most landscaped and manicured neighborhood. All of these berries are sour, like cranberries, and like cranberries they become delicious once cooked or dried with sweetener. Their sourness comes from their high content of vitamin C, vitamin A, vitamin E, and other nutrients. Most of them have more vitamin C than the same weight of oranges. These berries will not sustain life in the same way that grains and beans will, but they will provide a refreshing change of pace and will help keep your family healthy during a crisis. These plants will grow over a wide portion of the United States; some will even grow in Canada. If a plant is not native to your area, you can still grow it if you can provide the temperature range, soil type, and moisture level that it requires. Each plant will grow in specific “Zones” of temperatures described by the U.S. Department of Agriculture. To determine what zone you live in and what you can grow, see the USDA's climate zone map. This pretty little shrub is a member of the Rose family. In spring, it’s covered with large white flower clusters that shine among its glossy, dark-green leaves. Later, the flowers develop into purple-black berries. The berries are quite sour, but with sweetening they can be used to make delicious jelly, juice, and even wine. They are nutritional powerhouses, extremely high in antioxidants and other healthful nutrients. Aronia is native to the northeastern half of the United States and southeastern Canada, and will grow in Zones 3-8. It prefers moist, rich soil and full sunlight, but will grow in drier locations and part shade; it may not produce as many berries in these locations. Two recipes for aronia jam appear on the web site of Raintree Nursery, which also sells the plants. This is a vigorous bush or small tree that produces masses of vivid orange berries. The berries, which have a bright citrus-like taste to go with their bright orange color, are filled with vitamin A, C, E, and omega-3 fatty acids. During the Cold War, they were used in East Germany as a substitute for orange juice, and the plant is still widely cultivated in the former Soviet Union and eastern Europe. Seaberry thrives in dry, sandy soil and full sun, and does not do well when shaded by other trees. It can grow in Zones 3-7. In order to produce fruit, you must plant at least two plants, one male and one female; male plants do not produce fruit, but feature brownish clusters of flowers. One male can pollinate up to eight female plants. Seaberry is extremely thorny, so it can be used to create intruder-repelling hedges. Once established, the seaberry plant sends up vigorous shoots that will make a hedge even thicker and more impenetrable. The thorns make picking the berries somewhat difficult; one way around this is to cut off berry-filled branches and freeze them. Once frozen, the berries can easily be shaken off and used for juice or jam. When you extract juice from the berries, if you let the liquid settle it will separate into three layers: a creamy layer on top, oil in the middle, and juice and sediment on the bottom. Strain the juice through a coffee filter to remove the sediment and mix it with 6 parts water to one part juice, sweetened to taste. A recipe for seaberry jelly appears on this web site. For a recipe for seaberry schnapps, a drink that’s popular in Europe, go to this web site. This unassuming plant only grows to about 8 inches high, and it makes a beautiful edible ground cover. It is evergreen, holding its shiny, deep green leaves all year. It prefers shaded, moist, acidic soil, and will grow in Zones 2-8, although it doesn’t do well in long, hot summers. It produces its crop of tangy, cranberry-like berries in the fall. Lingonberry is native to the northern parts of Europe and North America and is closely related to cranberries and blueberries; it shares their refreshing tartness, and can be used just like cranberries, using the same recipes, to make a delicious sauce. It can also be used in muffins or to make jam. The berries are high in Vitamin C and Vitamin A, and the seeds contain omega-3 fatty acids. Goji or wolfberry, is native to China, and has been used in Chinese medicine for centuries. In recent years, the dried berries have become available at health food stores, at very high prices. Goji is a bushy vine, or viney bush, that can grow to 12 feet high and 8 feet wide; pruning will make it more of a bush than a vine. Goji has beautiful light-purple flowers that eventually become bright-red berries, which hang among the leaves like little coral earrings. The berries, which can be eaten fresh or dried, have a sweet/sour, tangy taste that is somewhat like a mix of plum, tomato, carrot, raspberry, and other flavors. Goji is relatively trouble-free to grow and does not mind poor soil or fairly cold winters, growing in Zones 5-9. It prefers a sunny location but will grow in light shade. You can order goji plants from nurseries, but you can also grow your own plants from seed using the dried berries. The pulp of the berries has a chemical in it that prevents the seed from sprouting, so first soak the berries in water for a couple of days. When they’re soft and mushy, carefully cut them open and scrape out the seeds. Put the seeds in a very fine strainer, like a tea strainer, and wash off all the pulp until the seeds are clean. Let them dry on a coffee filter or paper towel. Once they’re dry, you can plant them by putting them on top of the soil in a prepared pot and then lightly sprinkling a thin layer of soil over them. Keep the soil moist and when they sprout, place them in the sun or under a bright fluorescent light bulb. When the plants are a few inches high, you can transplant them outside. Here is a recipe for goji berry rice pudding. Evergreen huckleberry is native to the western half of North America, growing from Alaska to California, but it can be grown in other parts of the country as well. The berries, which ripen in late fall, are similar to blueberries and can be dried, made into jam, juice, or pancake sauce, or cooked into delicious pies. Because this bush keeps its glossy, dark-green leaves all year (except in the colder parts of its range), it’s an excellent landscaping bush for plantings around a home. In spring it’s covered in small white flowers. Evergreen huckleberry likes well-drained, acid soil and is one of the few fruits that actually thrives in shade. In shade, it can grow up to 6 feet high, whereas in sun it will only grow to about 3 feet high. It will grow in Zones 4-8. Huckleberry can be used in any recipe for blueberries, but here is a recipe for huckleberry jam. Black elderberry is an attractive, vigorous bush with feathery leaves; it can grow up to 12 feet high in a graceful fountain shape. The flowers are large, flat clusters, similar to Queen Anne’s Lace, making the bush very pretty when they appear in June. The flowers are edible; dipped into batter and then fried, they make delicious fritters. If left on the bush, the flowers will eventually develop into clusters of BB-sized purple-black berries that hang down heavily when they ripen in September or October. The berries are tiny and very tedious to pick one at a time, so to speed things up, it’s best to pick the entire berry cluster, take it home, and then relax at the kitchen table while you “comb” the berries off their stems with a fork. Don’t wear clothes you care about because they will become stained with purple. Elderberry likes to grow in moist, well-drained, sunny locations, and will grow in Zones 3-10. Elderberry fruit doesn’t taste very good fresh, and it gives many people a stomachache, but when the berries are cooked and the seeds strained out, they makes excellent syrup and jelly. Some people also make elderberry pie, leaving the berries whole; the pie is mildly crunchy from all the small seeds. Elderberry syrup is said to help the immune system fight off viruses by preventing viruses from attaching to cell walls in the body. It’s also an excellent source of Vitamin C. Health food stores sell elderberry syrup, but it’s much more cost-effective to make your own. One caution about elderberry: all parts of the bush except the flowers and the ripe fruit are poisonous. For safety, eat only the flowers and the fully ripe, cooked fruit. Do not eat “red” elderberry varieties, as they are poisonous. Only black varieties are safely edible. A recipe for elderberry jelly appears on this web site. If you make the recipe without the pectin, what you have is elderberry syrup; it will keep, once canned, for a long time. This web site has recipes for elderflower fritters, elderflower juice drink, and elderberry soap. The plants in the Ribes family include currants, gooseberries, and jostaberries (a cross between the two). They all have juicy, tangy fruit that makes excellent juice, wine, and pies; black currant has a particularly rich, musky flavor. They grow in moist, well-drained soil, and unlike many fruiting plants, they enjoy shade and do very well when planted along the shaded north side of a house. In addition, gooseberries tend to be very thorny, so they can be an excellent intruder-repellent when planted under a ground-floor window. These fruits are widely used in Europe, but are unfamiliar to most Americans because their cultivation was outlawed in the United States for most of the 20th century. This was because currants are a host for a virus that attacks white pine trees and other pines that bear their needles in clusters of five; they were banned to prevent the destruction of valuable timber. The federal law has since been repealed, but several states still prohibit growing these fruits. However, in many cases even these states will allow people to plant varieties of black currant that are resistant to the virus. These varieties include “Consort,” “Titania,” “Crusader,” and “Coronet” black currants. There are no resistant varieties of red currants, gooseberries, or jostaberries, so if you’re concerned about the laws or if you have pines growing in your area, check with your local agricultural extension office before planting them. This web site has seven pages of recipes using currants. The recipes given here are only a tiny sample of what’s available on the internet. If you grow any of these plants, take time to find and print out the recipes you like so you will have them when you need them. All of these plants have many varieties that have been bred for different characteristics. Some varieties may have larger or sweeter fruit, may have larger or smaller growth, may ripen earlier or later, or may be adapted to unusual climates or specific soils. It’s best to check with several nurseries to see what varieties are available before buying a particular plant, because through research, you may find one that will be especially strong and productive in your area. If you live in a very cold or very warm zone, nurseries that are located within your zone are your best bet for finding plants that are especially adapted to your conditions. There is a little known method used by American Special Forces to clean wounds that may be of great benefit to Survivalists in the event of an emergency. This is by intentionally introducing live maggots into the soft, damaged tissue wound. This process provides an effective cleaning of the tissue within the wound, successful disinfection and generally promotion faster healing. Throughout the pages of history this theory has been employed from the Mayan Indians to the Aboriginal tribes of Australia. The process can be traced back even further to the Renaissance era where military men would develop a wound and maggots started to colonize it. The doctors of these men would notice a marked reduction in the mortality rate associated with those soldiers when compared with those that never developed the maggots. Even during our own American Civil war a Doctor Joseph Jones noted that neglected wounds which filled quickly with maggots improved drastically after the worms destroyed the dead tissues leaving only the good surrounding areas unaffected. The techniques continued to be recognized even up into the 1st World War. It was shown that when a soldier was found after being left on the battlefield for an extended period of time their flesh wounds would rapid improvement after application of maggot to the affected area. Research has shown that in the 40's there were over 300 hospitals that used maggots in their wound programs. This strain of green bottle flies used eventually was nickname "Medical Maggots". To use this method you would need to wrap the maggots in a dressing which is placed over the patient's wounds for several days. Although the maggots may be permitted to move freely within the wound the dressing must be maintained in such as manner as to allow air to permeate the material thus providing oxygen to sustain the maggots' life. It is impossible for the maggots to reproduce within the wound since they are only in the larval stage at this point and their reproduction cycle is reserved for the adult flies. It is of vital importance however that when performing the final cleaning of the wound you must make certain that all maggots have been removed. The basic idea of all this is for a large number of maggots to consume the necrotic or damaged tissue while leaving the healthy tissue alone. The great part of using maggots for disinfecting a wound is that they are especially effective even on antibiotic-resistant bacteria. Maggots have been shown to destroy a wide range of bacteria including Staphylococcus aureus and group A and B streptococci. So now you have an effective method of infection control and wound healing that could be accomplished under many less then desirable conditions. Use this information carefully and do some additional research on your own. Question: Do you really need a BOB? I came across Death Valley Magazine earlier this week; it's a daily blog targeted towards private military contractors and those who want to be PMCs. It's a fun read (profanity alert though for the sensitive) and the blog's authors/contributors approach some of the conventional survival/urban survival concepts with their own, no-BS point of view. I like it, though your mileage may vary. 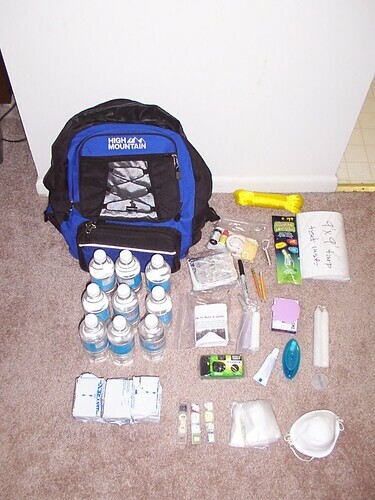 In this article, they ask the question - do you really need a bug out bag ? They point out that the bug out bag is intended to be the one thing that you grab on your way out the door; basically you hear that trouble is coming and have to be out the door, now. So in my opinion the reasons for having a BOB don’t really pan out, in just about every instance where you are supposed to use one you can’t. And the times you would need to evacuate you would have far enough advance notice that you would have time to pack an entire car or fortify your current location. So what do you guys think? Do you need a bug out bag, or is it a niche item, overemphasized by the survival/prep gurus of the world in an attempt to get you to buy more gear? Ok, let's face it, bad things happen to good people. I learned that shortly after I started by Bail Bonds business... I've seen people get in trouble and have to "disappear" for a short time. Just a couple points to cover in case this ever happens to you. Always try to be the "Grey Man". Avoid the lifestyle bumper stickers at all costs. The ones that were successful at hiding, all drove average vehicles, wore nothing that would stand out and did nothing to draw attention to themselves. Cash is king, while I do have some gold & silver put back, on the run or short term bugging out, use only cash. Split it up in your gear, don't keep it all on your person. Now the only exception to this that I've seen, that actually worked, was a Money Card. The woman was running from a violent relationship, her sister was putting money on a Walmart prepaid card, which works like a Visa for the most part, but you really have to trust the person applying the funds as they may have access to the card history. IF you decide to travel with a firearm, I would keep it limited to something compact and easily hidden. While I would MUCH rather have an M4 and a chest rack full of mags, I keep it to a quality handgun & mags VERY well hidden. Prepaid cell phone. If you find yourself in need of communicating, this is the ONLY way to go. Even then, use it enough and "they" can track it. Keep it short and sweet. It really helps to have some sort of GPS in your vehicle, getting lost can lead to all kinds of problems. Follow the traffic laws, more people are found by your average traffic cop doing his job than by Hi speed warrant teams. Unless you a have very deep pockets, you're going to need a source of income, and having a job on the books will not cut it, if you plan on staying free for any amount of time. So it's more often than not, it's going to be something in the building trades. Now, with the Job Market being what it is, unless you have usable skills, you may have some trouble finding something. Find out where the Day Labor's hang out, you will be with a bunch of Hispanics, but if you are Legal & speak English, you should have a better chance at finding something. Something else that has worked, find a construction site and offer to do clean up afterwords. Salvaging cans and scrap metal is an option too. Just keep in mind you're trying to stay alive and free, not trying to compete with Donald Trump. Keeping your expenses low. Living in your vehicle can be done and is being done a lot more than most people realize. Staying in a hotel will eat up funds and assist in getting you found. The successful one's I've spoke with, most were Van Dwellers, shopped as places like Aldi's and live cheap. I've added a link to a guy who lived successfully in his little Toyota Pickup for quite awhile to give you some idea's..
Use common sense, keep your head low and be the Grey Man.. There really isn't much else to say. One significant point I just want to rehash is to think about who is looking for you. The implications are significant because who is looking for you (how they look) plus their motivation and resources/ reach will dictate how you need to act. I can not help but reiterate that having a functional vehicle with up to date tabs (registration) is essential. Nothing flashy but the turn signals/ lights/ etc need to work. Also it is worth noting that having a valid license and insurance card is essential. Unless there is a warrant for your arrest if you have the right basic paperwork all but the worst traffic violation (driving 100 in a school zone or hitting someone) is handled with a simple ticket. Don't have that stuff and your likely going to face arrest and have your vehicle impounded and things will likely go downhill from there. Personally I think everyone should keep some cash around. For an average person a months worth of cash expenses is a good start and not a bad finish. If something weird is going on that is plenty to take a sudden 10 day vacation, particularly if you keep expenses down. Lets face it some lifestyles and jobs are a bit more prone to potential problems than others are. For a person with more risk having a higher percentage of their total assets on hand in physical cash would be prudent. When it comes to guns a good pistol with some mags is probably the way to go. Keep in mind that you are worried about basic self protection, not fighting off zombies. In a case extreme enough that your disappearance is going to be lengthy having a cache with some firepower would be wise. In many areas of the US even if a cop asks if you have a gun saying "Yeah I have a Glock/ 1911in my backpack/ trunk (depending on the region)" will not raise suspicion. However having 2 semi automatic rifles, a shotgun, a sniper rifle and a carbine sitting on the back seat might cause problems. When it comes to communicating with friends and family it really depends so much on who is looking for you. If anything short of a widespread law enforcement search or heaven forbid men who have split their adult lives between the back woods of FT Bragg and the 3rd world then a quick pre paid call to tell Momma that you will be away for awhile but are safe would be fine. I like the van/ truck idea. Edited to include: Three more things jumped out at me while pondering this through the day. First is about essential prescription medications. I am not highly informed on this topic but between meth maggots/ the abuse of prescription drugs in general, insurance and computers I do not think it is not so easy to discretely purchase meds these days. This is yet another reason to have some extra lying around, at least a 30 day (and ideally 90-180 days) supply. The last two are really just a bit more explanation of my thoughts on the "Grey Man" concept. I am sorry but aside from loitering around alleys and other obvious non typical behavior the biggest thing cops seem to profile is appearance. 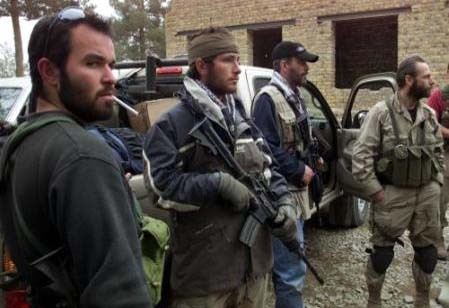 While certainly not always the case often scum bags dress like scum bags. Having a normal average appearance with decent clean clothes helps a lot. If you want to avoid police scrutiny instead of looking like a member of Pantera or somebody on the Discovery Channels gang special look like a normal clean cut guy. The sort of boring guy you won't look twice at or remember seeing. Going along with the "Grey Man" theme DO NOT BREAK ANY LAWS YOU ABSOLUTELY DON'T HAVE TO! Think about it. You have gone to great lengths to disappear for awhile. This is not the time to enjoy a nice cold roadbeer or punch the loudmouth jerk at the next table or try and get some weed. in a strange town or whatever. The "Grey Man" follows the rules, all of them, all the time, or at least it seems like he does. This is part of why he is so boring and nobody is interested in him. Hope you enjoyed this post as much as I did. Please give the VP some kudos for being nice enough to share his knowledge with us.